“I took that a step further and invited the congregation and had a competition,” Miller said. Miller, who is a nurse practitioner specializing in internal medicine, was hoping that by making walking a game it would promote personal fitness while also building community connection both within the church and without. 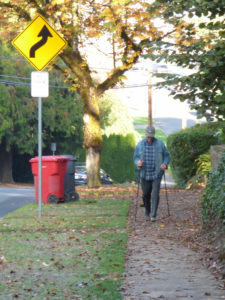 Miller’s walking groups, which meet mainly in the mornings, aren’t the only ones taking to the streets, however. Recently the Silverton Senior Center also has seen the re-ignition of a previously lapsed group, which has begun meeting at the center Friday mornings at 10:45 a.m. to walk around town or to explore the Oregon Garden. “What’s nice about the Oregon Garden is it has a variety of terrain,” co-organizer Kathy Hunter said. Not everyone needs to be a part of a group to reap the benefits of walking, however, and Douglas Jenkins is one of those who can be seen walking Silverton’s streets solo almost every day of the week. Although Jenkins said he tries to avoid walking in the pouring rain, he carries an umbrella and doesn’t let a little inclement weather keep him inside. Crisscrossing Silverton from one end of town to the other, he said he feels mostly safe, spending his time observing his surroundings and enjoying the day. But walking is not without some risk – not all streets offer sidewalks and pedestrian crossings inherently pose some danger. To insure they are as safe as possible, the Immanuel Lutheran walkers wear reflective clothing and flashing lights for pre-sunrise walks. And avid walker, Kristin Aalbue, who is a self-proclaimed “pedestrian advocate,” suggests that drivers – especially in areas with high foot traffic – carefully follow posted speeds, which allows increased reaction time. “Make a commitment to going 20 miles an hour in downtown, even if people are honking or whatever,” she advised. Aalbue, who suffers from chronic pain, has built her life around walking. She does not own a car and commutes via sidewalk to and from her many jobs. Over the years her daily walks have become more than just a way to get around – it’s also a kind of meditation.